Agriculture (a term which encompasses farming) is the process of producing food, feed, fiber, fuel, and other goods by the systematic raising of plants and animals. Agricultural products have been a main stay of the human diet for many thousands of years. The earliest known farming has been found to have derived from Southeast Asia almost 10,000 years ago. Prior to the development of plant cultivation, human beings were hunters and gatherers. The knowledge and skill of learning to care for the soil and growth of plants advanced the development of human society, allowing clans and tribes to stay in one location generation after generation. Because of agriculture, cities as well as trade relations between different regions and groups of people developed, further enabling the advancement of human societies and cultures. Agriculture has been an important aspect of economics throughout the centuries prior to and after the Industrial Revolution. Sustainable development of world food supplies impact the future of globalization and the long-term survival of the species, so care must be taken to ensure that agricultural methods remain in harmony with the environment. 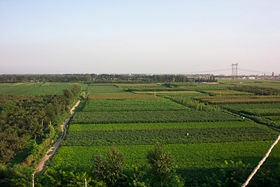 Farmlands in Hebei province, China. Agri is from Latin ager ("a field"), and culture is from Latin cultura, meaning "cultivation" in the strict sense of "tillage of the soil." A literal reading of the English word yields: "tillage of the soil of a field." In modern usage, the word "agriculture" covers all activities essential to food, feed, and fiber production, including all techniques for raising and processing livestock. The term agriculture may also refer to the study of the practice of agriculture, more formally known as agricultural science. The history of agriculture is closely linked to human history, and agricultural developments have been crucial factors in social change, including the specialization of human activity. Agriculture is by far the most common occupation, employing 42 percent of the world's laborers. However, agricultural production accounts for less than five percent of the gross world product (an aggregate of all gross domestic products). 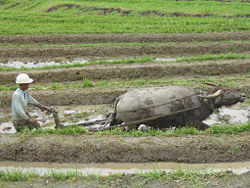 Plowing a rice paddy in Indonesia. Farming refers to a wide range agricultural production work, covering a large spectrum of operation scales (acreage, output, and so forth), practices, and commercial inclination. At one end of this spectrum, the subsistence farmer tills a small area with limited resource inputs, and produces only enough food to meet the needs of his or her family. At the other end of the spectrum is commercial intensive agriculture, including industrial agriculture. Such farming involves large fields and/or numbers of animals, large resource inputs (pesticides and fertilizers), and a high level of mechanization. These operations generally attempt to maximize financial income from produce or livestock. 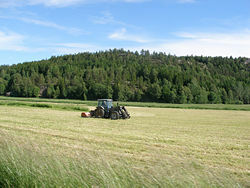 Farming with a tractor in Sweden. Modern agriculture extends well beyond the traditional production of food for humans and animal feed. Other agricultural production goods include cut flowers, ornamental and nursery plants, timber, fertilizers, animal hides, leather, industrial chemicals (starch, sugar, ethanol, alcohols, and plastics), fibers (such as cotton, wool, hemp, and flax), and biofuels such as methanol and biodiesel. Animals, including horses, mules, oxen, camels, llamas, alpacas, and dogs, are often used to cultivate fields, harvest crops, and transport farm products to markets. Animal husbandry involves breeding and raising animals for meat or to harvest animal products (like milk, eggs, or wool) on a continual basis. Mechanization has enormously increased farm efficiency and productivity in Western agriculture. The twentieth century saw massive changes in agricultural practice, particularly in agricultural chemistry. Agricultural chemistry includes the application of chemical fertilizer, chemical insecticides, and chemical fungicides, soil makeup, analysis of agricultural products, and nutritional needs of farm animals. Beginning in the Western world, the "green revolution" spread many of these changes to farms throughout the world, with varying success. 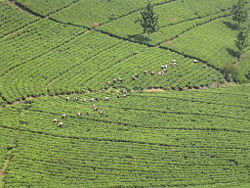 Tea plantation in Java, Indonesia. Engineers have developed plans for irrigation, drainage, and sanitary engineering, particularly important in normally arid areas that rely upon constant irrigation, and on large-scale farms. The packing, processing, and marketing of agricultural products are closely related activities also influenced by science. Methods of quick-freezing and dehydration have increased the markets for farm products. Airplanes, helicopters, trucks, and tractors are used in Western agriculture for seeding, spraying operations for insect and disease control, aerial topdressing, and transporting perishable products. Radio and television disseminate vital weather reports and other information such as market reports that concern farmers. 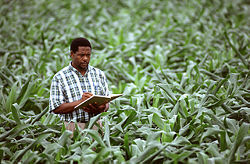 Computers have become an essential tool for farm management. According to the National Academy of Engineering in the United States, agricultural mechanization is one of the 20 greatest engineering achievements of the twentieth century. Early in the twentieth century, it took one American farmer to produce food for 2.5 people. By the end of the century, due to advances in agricultural technology, a single farmer could feed over 130 people. This has come at a cost, however. A large energy input, often from fossil fuel, is required to maintain such high levels of output. Other developments in agriculture include hydroponics, plant breeding, hybridization, better management of soil nutrients, and improved weed control. Genetic engineering has yielded crops that have capabilities beyond those of naturally occurring plants, such as higher yields and disease resistance. Modified seeds germinate faster, and thus can be grown in an extended growing area. However, genetic engineering of plants has proven controversial, particularly in the case of herbicide-resistant plants. Certain aspects of intensive industrial agriculture have been the subject of growing disagreement. The widening sphere of influence held by large seed and chemical companies, meat packers, and food processors has been a source of concern both within the farming community and for the general public. There has been increased activity against certain farming practices like factory farms. Another issue is the type of feed given to some animals that can cause bovine spongiform encephalopathy (also known as Mad Cow Disease) in cattle. There has also been concern because of the disastrous effects that intensive agriculture has on the environment. In the United States, for example, fertilizer has been running off into the Mississippi River for years and has caused a dead spot in the Gulf of Mexico, where the Mississippi empties. Intensive agriculture also depletes the fertility of the land over time, potentially leading to desertification. The patent protection given to companies that develop new types of seed using genetic engineering has allowed seed to be licensed to farmers in much the same way that computer software is licensed to users. This has changed the balance of power in favor of the seed companies, allowing them to dictate previously unheard of terms and conditions. 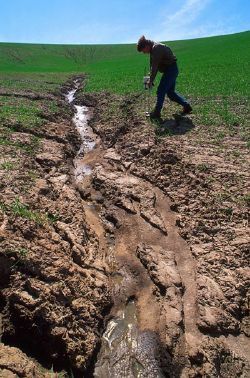 Soil conservation and nutrient management have been important concerns since the 1950s, with the best farmers taking a stewardship role with the land they operate. However, increasing contamination of waterways and wetlands by nutrients like nitrogen and phosphorus are of concern in many countries. Increasing consumer awareness of agricultural issues has led to the rise of community-supported agriculture, local food movement, "slow food," and commercial organic farming. Developed independently by geographically distant populations, evidence suggests that agriculture first appeared in Southwest Asia, in the Fertile Crescent. Around 9500 B.C.E., farmers first began to select and cultivate food plants with specific characteristics. Though there is evidence of earlier use of wild cereals, it was not until after 9500 B.C.E. that the eight so-called Neolithic founder crops of agriculture appeared: first emmer wheat and einkorn wheat, then hulled barley, peas, lentils, bitter vetch, chick peas, and flax. By 7000 B.C.E., sowing and harvesting reached Mesopotamia. By 6000 B.C.E., farming was entrenched on the banks of the Nile River. About this time, agriculture was developed independently in the Far East, with rice, rather than wheat, the primary crop. By 5000 B.C.E., Sumerians had developed core agricultural techniques including large-scale intensive cultivation of land, mono-cropping, organized irrigation, and use of a specialized labor force. Roman agriculture was built on techniques pioneered by the Sumerians, with a specific emphasis on the cultivation of crops for trade and export. Evidence suggests that maize was first domesticated in the Americas around 3000–2700 B.C.E. The potato, the tomato, the pepper, squash, several varieties of bean, and several other plants were also developed in the New World, as was extensive terracing of steep hillsides in much of Andean South America. During the Middle Ages, farmers in North Africa and the Near East developed and disseminated agricultural technologies including irrigation systems based on hydraulic and hydrostatic principles, the use of machines such as water wheels or norias, and the use of water-raising machines, dams, and reservoirs. Middle Eastern farmers wrote location-specific farming manuals, and were instrumental in the wider adoption of crops including sugar cane, rice, apricots, cotton, artichokes, aubergines, and saffron. They also brought lemons, oranges, cotton, almonds, figs, and sub-tropical crops such as bananas to Spain. 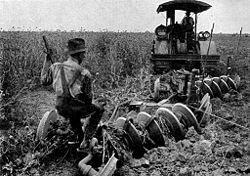 The invention of a three-field system of crop rotation during the Middle Ages, and the importation of the Chinese-invented moldboard plow, vastly improved agricultural efficiency. After 1492, a global exchange of previously local crops and livestock breeds occurred. Key crops involved in this exchange included the tomato, maize, potato, cocoa, tobacco, and coffee. By the early 1800s, agricultural practices, particularly careful selection of hardy strains and cultivars, had so improved that yield per land unit was many times greater than that seen in the Middle Ages. With the rapid rise of mechanized agriculture in the late nineteenth and twentieth centuries, particularly in the form of the tractor, farming tasks could be done with a speed and on a scale previously impossible. These advances have led to efficiencies enabling modern farms in several nations including the United States, Argentina, Israel, and Germany, to output volumes of high quality produce per land unit at what may be the practical limit. Specific crops are cultivated in distinct growing regions throughout the world. The following tables detail the major crops for the world in millions of metric tons, based on Food and Agriculture Organization (FAO) figures for 2004. Coffee plantation in São João do Manhuaçu City, Minas Gerais State, Brazil. 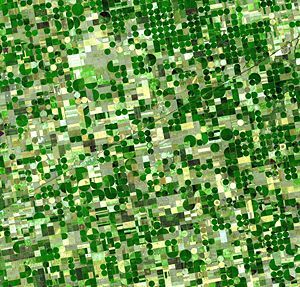 Satellite image of circular crop fields characteristic of center pivot irrigation in Haskell County, Kansas in late June 2001. Healthy, growing crops are green. Corn would be growing into leafy stalks by then. Sorghum, which resembles corn, grows more slowly and would be much smaller and therefore, possibly paler. Wheat is a brilliant gold as harvest occurs in June. Fields of brown have been recently harvested and plowed under or lie fallow for the year. Agriculture is cited as a significant adverse impact to biodiversity, due to reduction of forests and other habitats when new lands are converted to farming. Some critics have also included agriculture as a cause of global climate change or "global warming." Domestication of plants is done in order to increase yield, improve disease resistance and drought tolerance, ease harvest, and to improve the taste and nutritional value of plants. Centuries of careful selection and breeding have had enormous effects on the characteristics of crop plants. Plant breeders use greenhouses and other techniques to yield as many as three generations of plants per year so that they can make improvements all the more quickly. For example, average yields of corn (maize) in the U.S. increased from around 2.5 tons per hectare (40 bushels per acre) in 1900 to about 9.4 tons per hectare (150 bushels per acre) in 2001. Similarly, worldwide average wheat yields have increased from less than 1 in 1900 to more than 2.5 tons per hectare in 1990. South American average wheat yields are around 2 tons per hectare, Africa under 1 ton per hectare, Egypt and Arabia up to 3.5 to 4 tons per hectare with irrigation. By contrast, the average wheat yield in countries such as France is over 8 tons per hectare. In industrialized agriculture, crop "improvement" has often reduced nutritional and other qualities of food plants to serve the interests of producers. After mechanical tomato-harvesters were developed in the early 1960s, agricultural scientists bred tomatoes that were harder and less nutritious. In fact, a major longitudinal study of nutrient levels in numerous vegetables showed significant declines over the second half of the twentieth century—garden vegetables in the U.S. at the end of the century contain on average 38 percent less vitamin B2 and 15 percent less vitamin C than 50 years earlier. Genetic engineering has been employed in some parts of the world to speed up the selection and breeding process. The most widely used modification is an herbicide-resistance gene that allows plants to tolerate exposure to glyphosate, which is used to control weeds in the crop. A less frequently used, but more controversial modification causes the plant to produce a toxin to reduce damage from insects. There are also specialty producers who raise less common types of livestock or plants. Genetic modification (GM) has proved controversial. Proponents of current genetic engineering techniques believe it will lower pesticide usage and has brought higher yields and profitability to many farmers, including those in developing nations. A few genetic engineering licenses allow farmers in less economically developed countries to save seeds for next year's planting. Many opponents of current genetic engineering believe the increasing use of GM in major crops has caused a power shift in agriculture towards biotechnology companies, which are gaining excessive control over the production chain of crops and food, and over the farmers that use their products, as well. A number of countries banned the use of GM foods in the face of such controversy and over concerns for food safety and quality. In April 2004, Hugo Chávez announced a total ban on genetically modified seeds in Venezuela. In January 2005, the Hungarian government announced a ban on importing and planting of genetically modified maize seeds, although these were agreed authorized by the European Union. In 2006, American exports of rice to Europe were interrupted when much of the U.S. crop was confirmed to be contaminated with unapproved engineered genes, possibly due to accidental cross-pollination with conventional crops. The U.S. government later declared the rice safe for human consumption, and exports to some countries were resumed. During the 1920s, Rudolf Steiner initiated a philosophical movement in Germany that provided the foundation for a new interpretation of the relationship of human spiritual growth, physical well-being, and quality of food that is consumed. In the U.S., J. I. Rodale introduced organic farming and made it popular in the 1940s. The essence of organic farming is that only natural processes are utilized in the growth of food. The quality and care of the soil is of utmost importance to achieve good crop return. Pest control is based on natural pest life cycles. Increased concern in the public, especially in developed countries, began to grow through the last decades of the twentieth century as questions arose about the health effects of chemical pesticides and fertilizers. DDT, developed in World War II, was a very powerful insecticide that appeared to solve all "pest" problems of farmers. However, it was found to destroy healthy growth and reproduction of wildlife, resulting in the banning of DDT in the 1960s. The organic farm movement gained momentum through the 1970s and 1980s. By the 1990s, the retail market for organic farming in developed economies had grown about 20 percent due to increasing consumer demand. 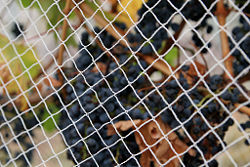 In 2002, The U.S. Department of Agriculture (USDA) established standards for the labeling of organic commercial produce. Interest in biofuels—fuel derived from living organisms including biomass or their metabolic byproducts, such as manure from cows—grew throughout the end of the twentieth century as these are renewable energy sources, unlike other natural resources such as petroleum, coal, and nuclear fuels. Demand escalated in the United States in the early twenty-first century, when dependency on foreign oil became a national issue following the September 11, 2001 attacks on the World Trade Center. Ethanol fuel is produced from sugar cane in Brazil and from the cellulose of a wide variety of plants, including cornstalks, poplar trees, and switch grass, as well as waste left over from the forest products industry, wheat, oat, and barley straw. Biodiesel has been created from a variety of agricultural products including rapeseed and soybean oils, waste vegetable oil, switch grass, and animal fats. The demand for such alternative energy sources significantly impacted farming priorities in the early twenty-first century. …imply a certain interspersion of land-uses, a certain pepper-and-salt pattern in the warp and woof of the land-use fabric? If so, can government alone do the weaving? I think not. It is the individual farmer who must weave the greater part of the rug on which America stands." ↑ World. CIA Factbook. Retrieved February 25, 2007. ↑ Greatest Engineering Achievements of the Twentieth Century. National Academy of Engineering. Retrieved February 25, 2007. ↑ “Dead Zone” in the Gulf: Addressing Agriculture’s Contribution. Amber Waves. Retrieved February 25, 2007. ↑ 4.0 4.1 FAOSTAT. Food and Agricultural Organization of the United Nations. Retrieved February 25, 2007. ↑ William H. Friedland and Amy Barton, Destalking the Wily Tomato: A Case Study of Social Consequences in California Agricultural Research (University of California at Santa Cruz, 1975). ↑ Donald R. Davis and Hugh D. Riordan. "Changes in USDA Food Composition Data for 43 Garden Crops, 1950 to 1999," Journal of the American College of Nutrition Vol. 23, No. 6 (2004): 669–682. ↑ Economic Impact of Transgenic Crops in Developing Countries. AgBioWorld. Retrieved February 25, 2007. ↑ Zambia Allows Its People To Eat. The Center for Consumer Freedom. Retrieved February 25, 2007. ↑ Africans vow to resist any US pressure on GMOs. The Peninsula. Retrieved February 25, 2007. ↑ Zambia Says Ban on Gene-Altered Maize Stands. Planet Ark. Retrieved February 25, 2007. ↑ Jason Tockman, Venezuela: Chavez Dumps Monsanto, Green Left Weekly, May 5, 2004. Retrieved March 17, 2007. ↑ New study reveals signs of toxicity of GE maize approved for human consumption. Greenpeace European Unit. Retrieved February 25, 2007. ↑ Agriculture Department Probes Rice Flap. National Public Radio. Retrieved February 25, 2007. ↑ The National Organic Program. AMS-USDA. Retrieved February 25, 2007. ↑ Aldo Leopold, For the Health of the Land: Previously Unpublished Essays and Other Writings (Island Press, 1999 ISBN 1559637633). Artz, F. B. 1980. The Mind of the Middle Ages, 3rd ed. University of Chicago Press. Davis, Donald R., and Hugh D. Riordan. 2004. "Changes in USDA Food Composition Data for 43 Garden Crops, 1950 to 1999." Journal of the American College of Nutrition Vol. 23, No. 6: 669–682. Friedland, William H., and Amy Barton. 1975. Destalking the Wily Tomato: A Case Study of Social Consequences in California Agricultural Research. University of California at Santa Cruz. Watson, A. M. 1974. "The Arab agricultural revolution and its diffusion." The Journal of Economic History 34. Wickens, G. M. 1976. What the West Borrowed from the Middle East: Introduction to Islamic Civilization. Cambridge University Press. This page was last modified on 9 February 2019, at 16:24.